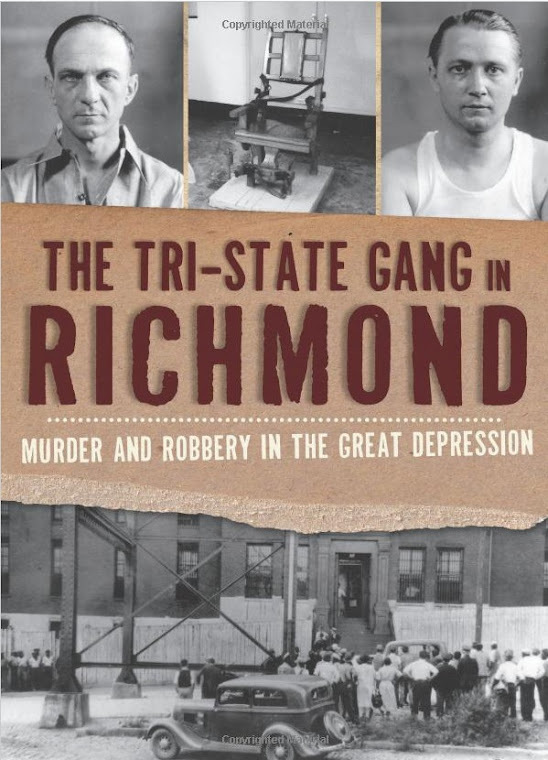 Frequent readers of The Shockoe Examiner will not be strangers to the name Wilfred Cutshaw. The Richmond City Engineer from 1873 until his death in 1907, Cutshaw tolerated no interference in his dictation of the streetscape and municipal architecture of this city for more than thirty years. 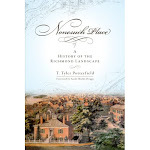 His effect on the City was profound, and modern Richmonders who walk our tree-lined streets pass by buildings which were once Cutshaw’s markets, schools, and armories. The waterworks which furnish fresh water to and many Richmond parks all originated in the City Engineer’s office, and miles of well-designed streets still bear witness to Cutshaw’s ability. 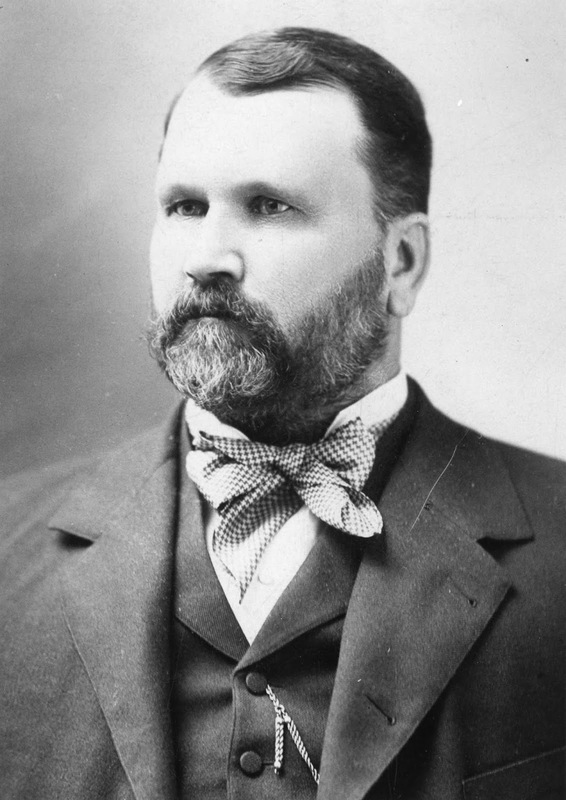 Richmond City Engineer Wilfred Emory Cutshaw (1838-1907). When Cutshaw died, one commentator predicted, “…the future will show that, quiet and reserved as he was, he was a far-seeing enthusiast, and was planning and thinking of a far greater city than most of us can dream of. Years hence his work and purposes will be appreciated and people will realize his wisdom.” Hopefully, that day has come with the recent placing of an historical marker to Cutshaw’s memory and influence near the Roundhouse in Byrd Park. It is a fitting memorial to a selfless civil servant who believed fervently that the fabric of a well-designed, attractive, and modern city could in itself be the tide that raised all boats for all Richmonders. 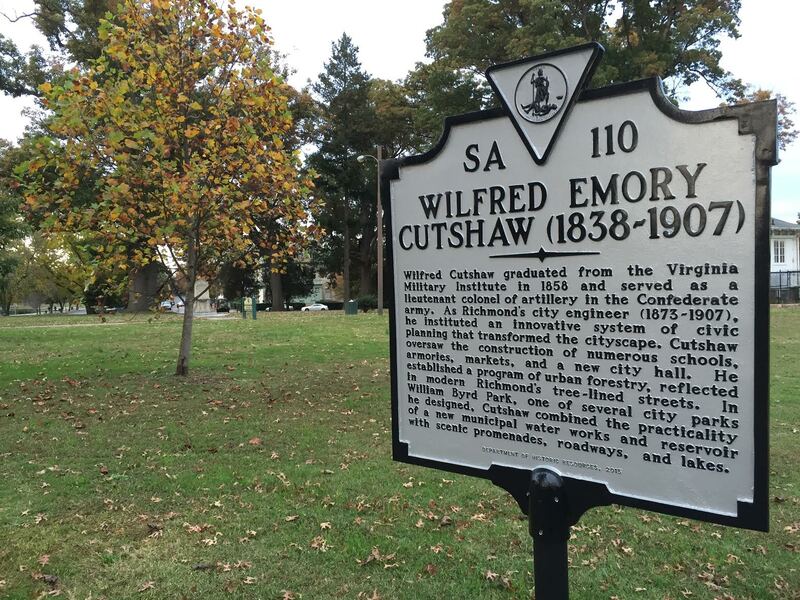 This is the new Virginia Historical Marker that commemorates Cutshaw’s career and contributions, located in Byrd Park near the Roundhouse. A former engineering professor, Cutshaw became an officer in the Confederate artillery and lost a leg only hours before the surrender at Appomattox. He was appointed Richmond City Engineer in a year of financial collapse so severe that it became known as “The Panic of 1873.” Continually thwarted by City Council with their miserly appropriations, Cutshaw nevertheless made enormous strides in organizing, improving, and beautifying the Richmond cityscape. One of the first and most important acts as City Engineer was to argue for the demolition of the first Richmond City Hall (1814) and eventually oversaw its replacement on the same site with what we call today Old City Hall. Cutshaw built four armories, one of which survives on Leigh Street and soon will be the future home of the Black History Museum. He laid out William Byrd Park, and Libby Hill Park, Chimborazo Park, and Jefferson Park, planting them with trees grown at the municipal nursery he established. The perpetually underfunded City managed to embark on a program of westward expansion and upgrading existing infrastructure, laying out streets and grids systematically with proper grades and drainage and planting the new streets with suitable species of trees. Cutshaw, who established a City tree nursery near where the Carillon stands today, originally visualized those tree-lined streets that residents of Richmond have grown to love and demand. In his 1904 publication, Trees of the City, Cutshaw urged Richmonders to go to their public parks and learn the names of the various species of trees from the park-keepers “so persons could learn, and instruct others.” He wanted Richmond out in his parks and on the streets, protected from the summer sun. The Cutshaw—era Leigh Street Armory, built in 1895 and recently renovated as Richmond’s Black History Museum. Cutshaw’s municipal buildings invariably reflected his taste for the Italianate style, although by late in his career they must have looked rather dated. Most Cutshaw-era schools feature corbeled panels surrounding the windows and almost always have a belt course of stone or brick. 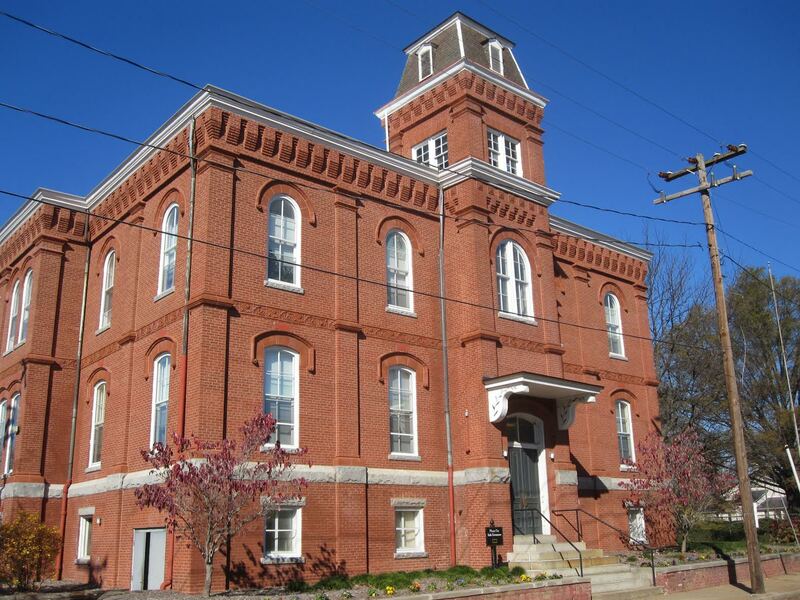 These decorative features can be found in the designs for schools such as: Marshall School (1886) and its twin, Stonewall Jackson School (1886), Moore Street (1887), Navy Hill (1893), Nicholson Street (1893), Ruffner / Central (1894), and Randolph (1896). Of these buildings, Stonewall Jackson Schoolstill stands at 1520 West Main Street, and Randolph School is still at 300 South Randolph Street. Moore Street School is today an unused wing of George Washington Carver Elementary School at 1110 West Leigh Street, but the exterior still retains all the hallmarks of Cutshaw’s architectural tastes. 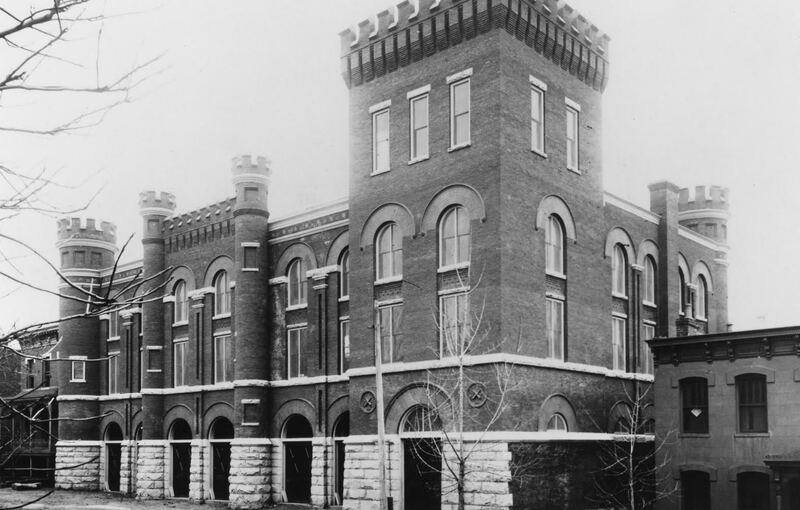 The Howitzers Armory stood on the same block as the Cavalry Armory, both the creations of Cutshaw’s City Engineer’s office. Both were torn down in the early 1970s. Cutshaw obviously had some strong ideas about what armory buildings should look like as most he designed had what he felt were requisite crenellation and towers. 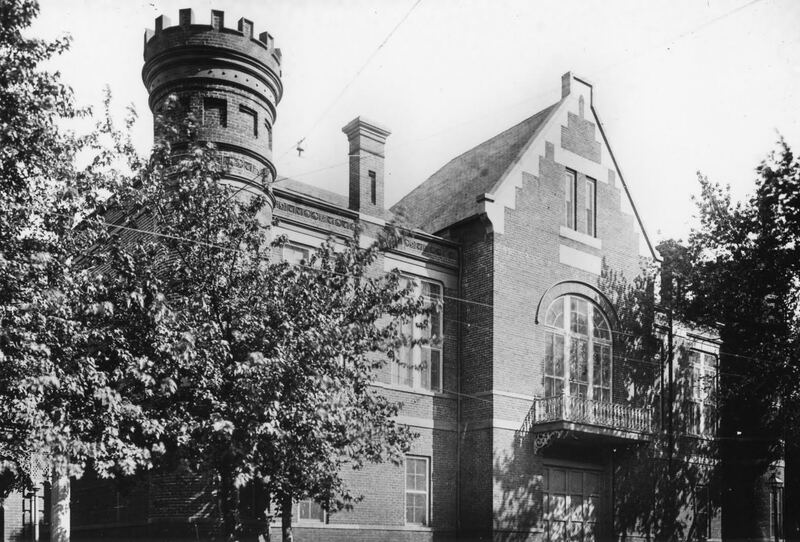 Unlike the comparatively plain city schools of the era, these armories often featured bands of elaborate terra-cotta decoration, like that seen on the 1895 Leigh Street Armory at 122 West Leigh Street. Edgerton Rogers, best known as the architect of the Dooley mansion,“Maymont,” was a member of the militia who was commissioned by his fellow troops to design what became known as the Cavalry Armory. That building stood back-to-back on the same block with Cutshaw’s 1895 Howitzers Armory (the downtown campus of J. Sargeant Reynolds stands on the site today). 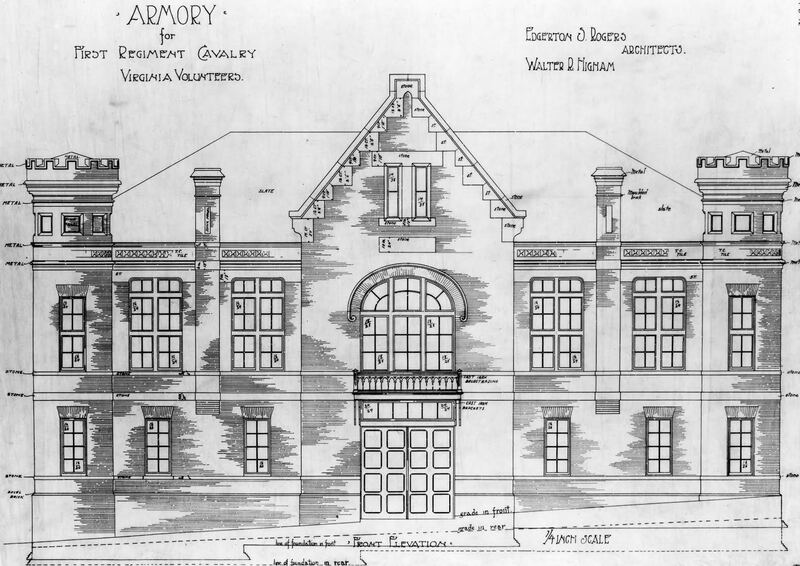 Rogers and his partner, Walter Higham, designed a comparatively delicate-looking building unlike any other Richmond armory. Nevertheless, the trademark Cutshaw towers and crenellations have been grafted onto each corner. 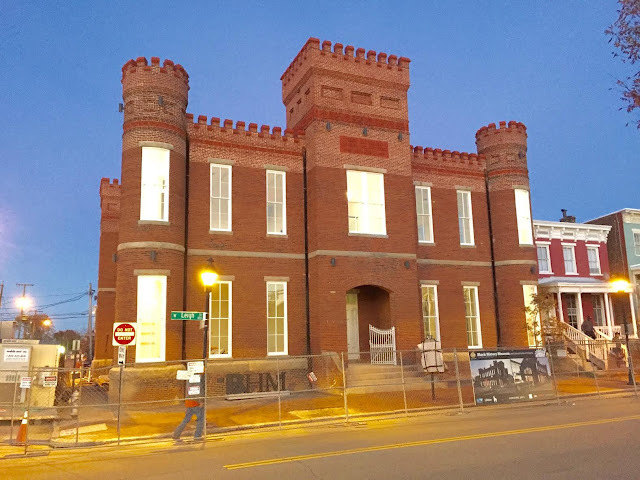 It is not hard to sense the commanding presence of the City Engineer (who had the final approval of any design), demanding that Richmond armories have castle-like towers. 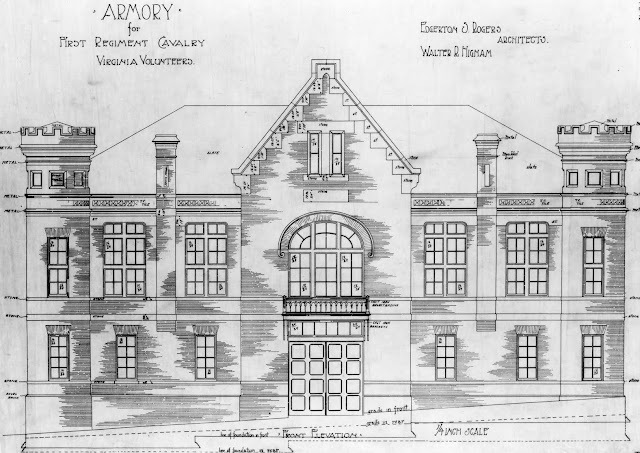 This comparatively delicately-detailed armory was designed by Richmond architects Edgerton Rogers and Walter Higham but it did not escape the hand of the City Engineer. 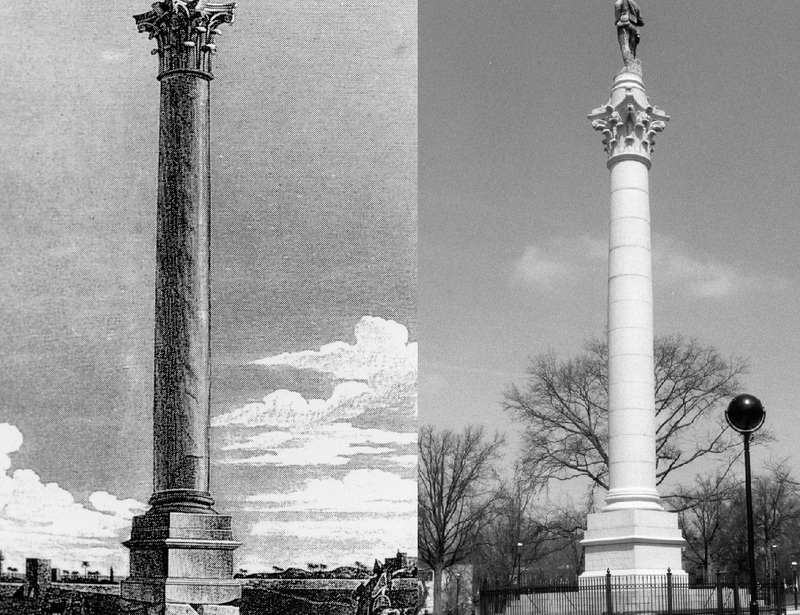 In the same way, Cutshaw seized control of the design committee for the 1894 Confederate Soldiers and Sailors Monument, dictating its appearance and proportions should match that of a Roman triumphal column, built in 297 AD and which still stands in Alexandria, Egypt. Needless to say, all other designs were immediately discarded. What Cutshaw wanted and what Cutshaw envisioned is exactly what stands in Libby Hill Park today. Pompey’s Column in Egypt, 297 AD. At Cutshaw’s insistence, this was used as the model for Richmond’s Confederate Soldiers and Sailors Monument. 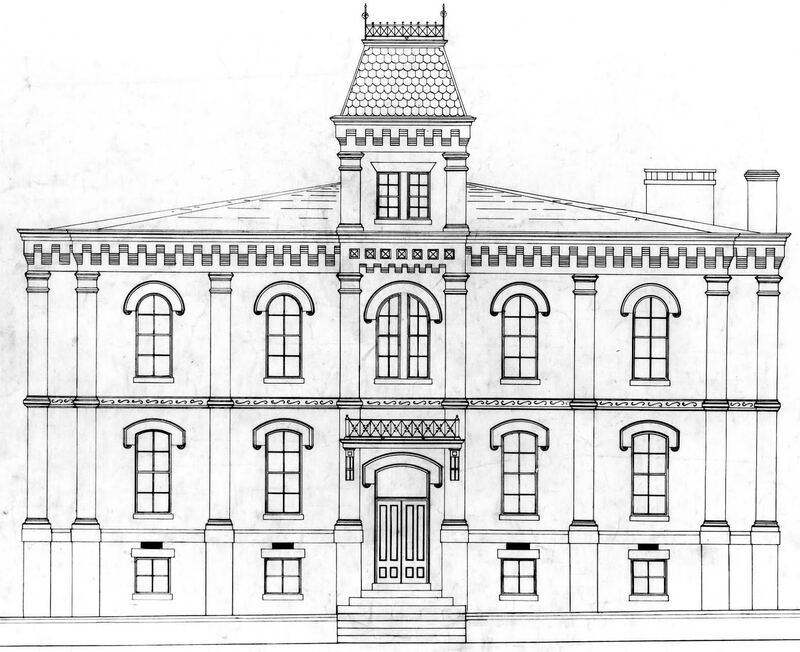 Cutshaw demanded the replacement of Richmond’s original city hall, which had stood north of the Capitol since 1814. When the architect of the replacement hall was removed from supervising its construction, Cutshaw assumed management of the project and completed it in 1894. One of the most urgent needs faced by the City Engineer from the beginning of his tenure was the supply of pure water for Richmonders. The Marshall Reservoir, which stood just west of Hollywood Cemetery, was old and inadequate. Cutshaw designed a new reservoir in the middle of what eventually became known as William Byrd Park, and surrounded the municipal water impoundment with decorative lakes, vistas, groves and roadways. Like the reservoir located in a public park, the accompanying Pump House below the park featured a recreational area on top of the pump rooms. The massive pipes that once linked these Cutshaw projects can still be seen in the woods behind the Carillon. 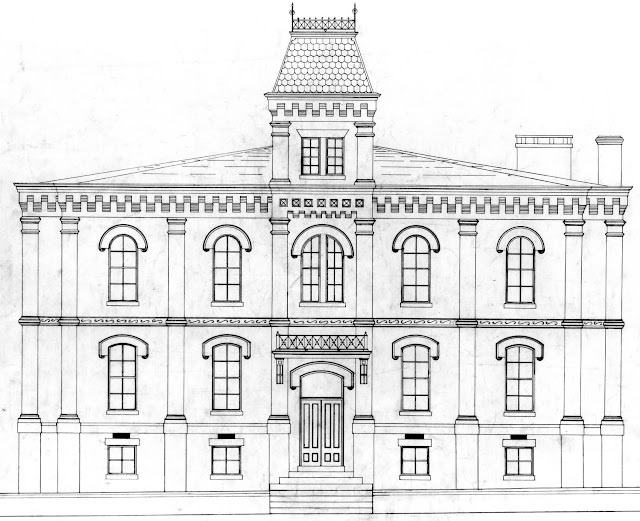 The Randolph Street School, one of Cutshaw’s Italianate Richmond schools, has been reused and enlarged several times and continues to serve the Randolph neighborhood. Colonel Cutshaw took hold of the rebuilding and reconstruction of the city after it had been ravaged by war… He planned the erection of City Hall, the finest structure in Richmond; he made the lines and grades for the streets and avenues, the most beautiful in the South; he laid out the parks and boulevards. His greatest ambition was to turn every available foot of space into recreation resorts for the public, and especially for the children. 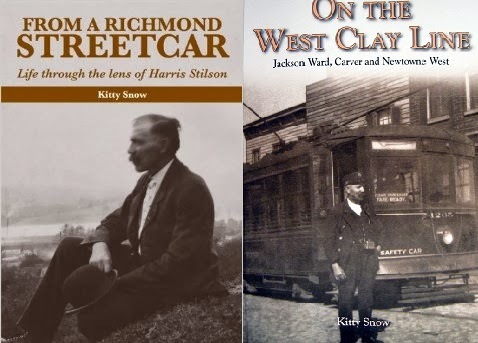 Cutshaw’s influence on modern Richmond has been largely ignored. Cutshaw Avenue is the most visible commemoration, but few know the story of the man the street is named for. The small triangular park at Stuart and Meadow streets and Park Avenue is officially “Cutshaw Place,” but that name has become obsolete and is today used for a block of Cutshaw Avenue west of Willow Lawn. In the early 1970s, Wilfred Cutshaw was honored with a small plaque inside the eastern entry of the building where the City Engineer’s offices were once located. The “far greater city” that Cutshaw was praised for planning has arrived. Today’s Richmond has many demands on its time and resources and citizens, and we live in a far less contemplative world than that of 1900. Nevertheless, take a little time to go to Byrd Park and read a brief account of Cutshaw’ career on that marker, turn and look around you at the reservoir wall, the lakes and the roadways that wind pleasantly among the huge old trees. As your gaze wanders, just imagine how pleased the old City Engineer would be that you were there. Bravo Selden. Cutshaw is one of my heroes. As you have so eloquently stated, the Richmond we see today is largely "Cutshaw's Richmond." My hope is that one day, some enterprising local historian/historians might piece together a folio-sized book with that title, exploring the Cutshaw legacy in detail, with city maps showing just what was where, or else still is there. His "Trees of the City" was a visionary masterpiece, and I wish that all of the members of Richmond Tree Stewards could have a copy. The marker in Byrd Park is most appropriately placed, as it was Cutshaw's creation, both as a recreational area and the site of the New Reservoir--which we confront every time we try to drive through it, and have to pick a direction at the Columbus statue! I regret that came upon this in laggard fashion and will pass it along.